Avinor Oslo Airport plays a crucial role as the hub of Norway’s aviation system, serving domestic and international passenger and cargo flights. Upon opening in 1998, the new airport boosted its capacity to handle 17 million passengers annually, but less than a decade later, it was clear that demand would soon outgrow capacity. It was then that the board of Avinor, owner of the airport, began planning a major expansion in close collaboration with airlines and handling companies. And they were right. By 2013, nearly 23 million passengers flew to and from the airport. Avinor opened the design and engineering project to international competition in 2007, receiving hundreds of bids. Aas-Jakobsen, one of the largest civil and structural engineering firms in Norway, teamed with leading architectural, engineering, landscape-design and project-management firms (including Nordic Office of Architecture, Cowi, Norconsult, Engineer Per Rasmussen and several subcontractors) to form Team_T, which won the airport contract in February 2009. 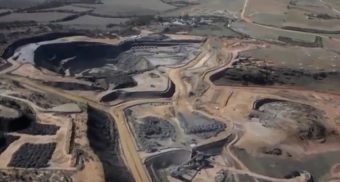 Within a year, the preliminary design project was complete. This quick turnaround was largely due to close cooperation among Team_T and ÅF Advansia, the project- and construction-management firm. The project was approved by Avinor’s board in January 2011, and the main expansion project started a few months later. A structural model from the west shows the passenger drop-off area. Central to the $1.7 billion expansion is a new terminal. The 1.2-million-square-foot Gardermoen Terminal 2 adds 11 new bridge-connected gates and 10 remote aircraft parking positions that will bring the airport’s capacity to 28 million passengers per year when it opens in 2017. Designed to be an environmental role model for construction and operational sustainability, the expansion provides the most climate-neutral facility possible. The new terminal is built of steel, glass and natural materials such as Norwegian wood. It also increases the airport’s use of renewable energy and will not contribute to groundwater contamination. The architecture keeps with Norwegian sensibilities: simple, orderly, efficient, modern and attractive. Gardermoen Terminal 2 integrates into the original terminal using the same characteristic roof design and volume. Passengers will have large congregating areas before and after they go through security, which will be expanded with 12 new tracks and concentrated in one area. After clearing the security check, passengers will walk a short distance to domestic and international flights. Emphasis is placed on good accessibility and universal design. New cafés and restaurants, more and larger shops, well-placed restrooms, a baby-care room and an additional baggage-claim area all enhance the passenger experience. The project also improves airport access with an expanded railway station and a redesigned road system. The new road will make it easier to reach the airport by car and bus, and safer for passengers to walk to the terminal from short-term parking. The project also includes new taxiways. Because the airport needs to operate during expansion, construction of Gardermoen Terminal 2 and other property improvements can’t impact passengers and employees. Contractors face the daily challenge of ensuring safety, airport security and normal operations while nearly doubling the terminal’s floor area. 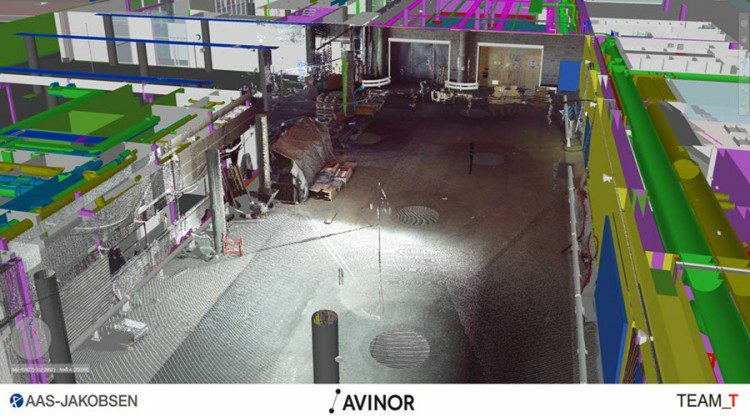 The Oslo Airport expansion is an owner-run project, and Avinor required the design team and subcontractors to use Building Information Modeling (BIM) for the project. The owner’s objective was clear: achieve better collaboration and more-effective design processes; build correctly from the beginning; and, ultimately, create a better building. 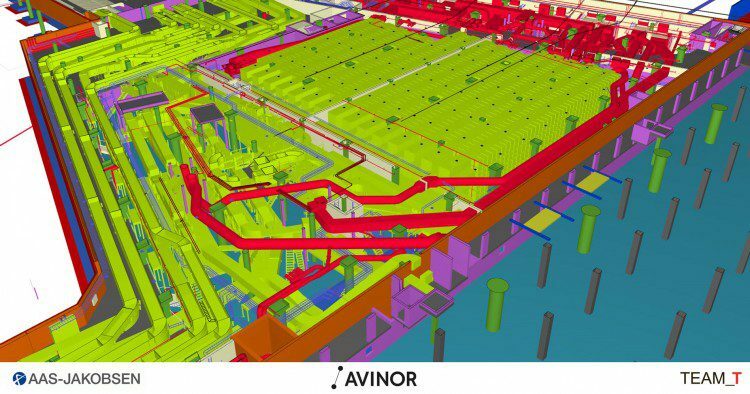 To keep the project on track, Avinor created a team of internal project managers, including five BIM coordinators to ensure BIM is used to the project’s best advantage by the 150 contributing contractors. Aas-Jakobsen structural engineers act as BIM coordinators in charge of solving related subcontractor challenges. BIM is being pushed forward by exploring best practices for a team of more than 20 subcontractors. Although Aas-Jakobsen created building geometry and reference models as a starting point for structural design work as early as 2000, the firm’s experience building true “building information models” was limited in 2009. In fact, few on the project team knew much about BIM, so there was a steep learning curve to move from 2D drawings and simple 3D models to BIM. 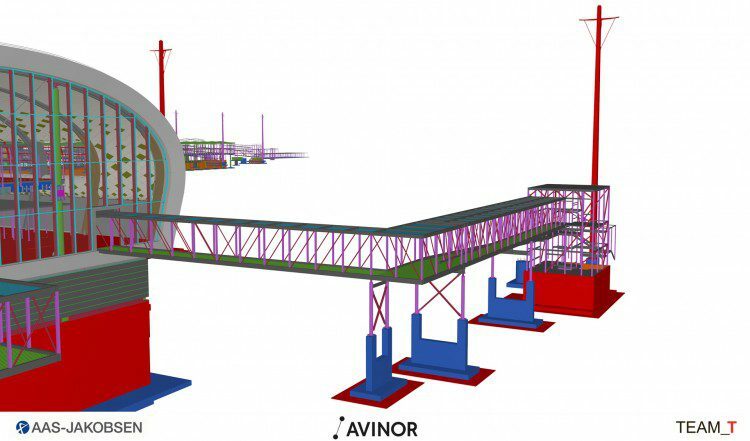 Avinor also had the foresight to go a step further, requiring not simply BIM, but Open BIM, so models could be shared and combined with other contractors’ models. This presented an early problem, because some software applications being used didn’t support Open BIM at that time. Aas-Jakobsen and some of the large subcontractors chose Tekla Structures, which supported Open BIM with its ability to import and export The Industry Foundation Classes (IFC) file format, which enables interoperability among different software applications and establishes international standards to import and export building objects and their properties. This was critical for the variety of applications being used and because some contractors weren’t based in Norway. Many contractors couldn’t fulfill that requirement until their software vendors supported IFC, which made it difficult to collaborate in the project’s early design years. The cast-in-place concrete reinforcement is modeled and communicated to construction crews. Because of the sheer size, Gardermoen Terminal 2 required more than 100 reference models for the architectural design, HVAC and MEP as well as for the new baggage-handling system and hundreds of meters of airside terrain. Aas-Jakobsen built a single structural BIM for the new terminal, but because of its size, limitations in software and the need for approximately 50-60 architects to work simultaneously, architects modeled the terminal in sections, creating several models. 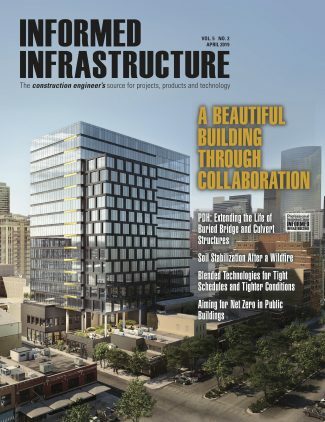 To collaborate with Design Built subcontractors, Aas-Jakobsen defined a process to split the structural model into smaller parts for the steel fabricator and precast concrete contractor to do their work. When finishing the project, there’s a goal to combine all structural models back into one single model, producing an accurate representation of the entire building. Because the models could be imported and exported as IFC files, they were easily merged into a master model. Open BIM was a new way of working in 2009. Many of the subcontractors hadn’t even seen a 3D model before, but now most routinely use BIM. Open BIM and the IFC file format are essential for collaboration and productivity, because everyone can use the best software applications for their portion of the project. 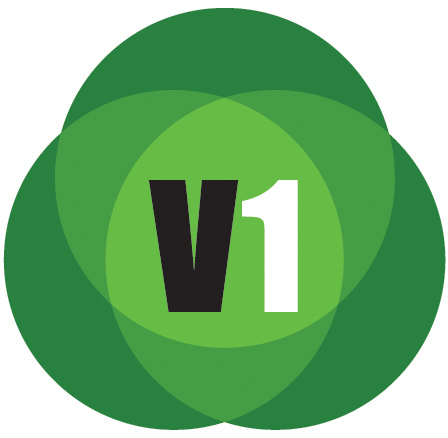 A collaboration model was used to coordinate construction as well as communicate operations. In this image, parts of the baggage-handling system are highlighted in red. As the project unfolded and more applications supported Open BIM, Markussen saw the value firsthand over 2D drawings and simple 3D models. Combining the models created by subcontractors allowed clashes to be identified and corrected before construction began, preventing expensive, project-stopping jobsite fixes. Detailed information contained in the Tekla structural model enabled Aas-Jakobsen to generate highly accurate quantities for steel reinforcement and concrete within minutes. For example, Aas-Jakobsen knew exactly how much concrete and reinforcement the project would require months before concrete pours began. The models contribute to quality assurance and are extensively used throughout the project. The Tekla models enable the visualization and understanding of critical structural details such as how to create reinforcement. It allows users to effortlessly extract documentation, generate quantity take-offs for materials and create schedules. The models also benefit subcontractors, who, for example, used the Tekla Open API that connects Tekla Structures to the fabricator’s software, enabling the accurate information contained in the structural model to drive rebar production. Laser scanning is used to verify and check construction against the model. 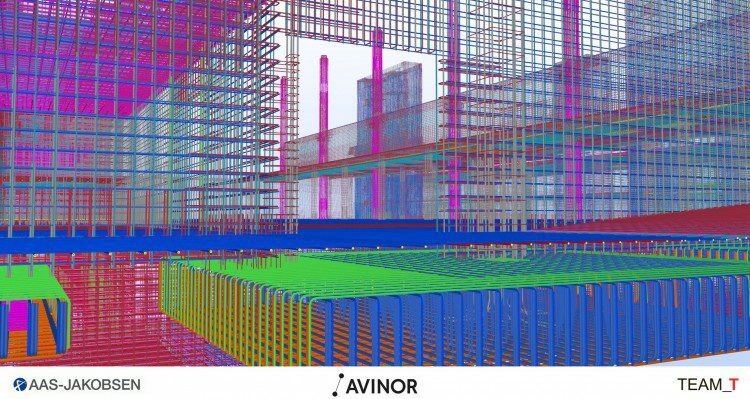 In addition to improving project collaboration and productivity during design and construction of the expansion, Avinor was planning for the future when it required Open BIM. The airport will continue to be renovated and expanded through the years, and having accurate, information-rich models will make it easier and less expensive to make those changes. Fifty years from now, it may be challenging to find software that’s compatible with the ancient proprietary file formats of the 2010s, but because IFC is essentially a text-based format, these models will be accessible with some tool currently unknown to the industry. 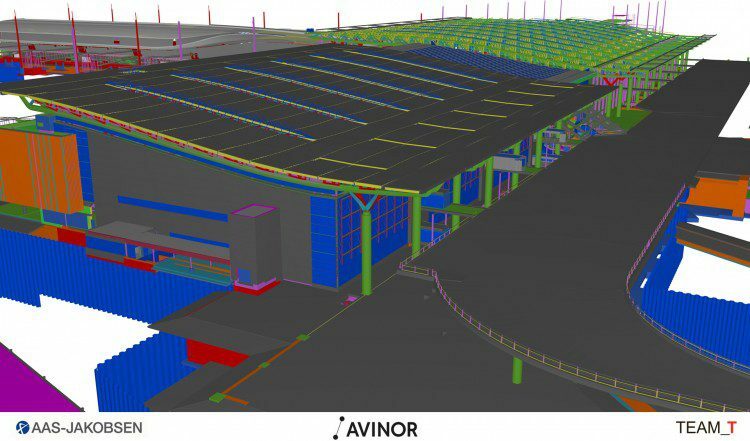 After the terminal is opened, Avinor’s facility managers also will refer to the models to make it easier to maintain airport structures. The richness of the building information contained in the models will be an asset for Avinor long after Aas-Jakobsen has moved on to new projects. Bjørnar Markussen, B.Sc., is a civil engineering/BIM engineer for Aas-Jakobsen; e-mail: bma at aaj.no.